This article explains how to upload & embed presentations online. With PowerPoint Online Viewer you can view your presentations online or embed any presentation into a blog post or website. Also, using the Share link option you can let your boss, co-worker, client or classmate view your presentations along with everyone else in the office. 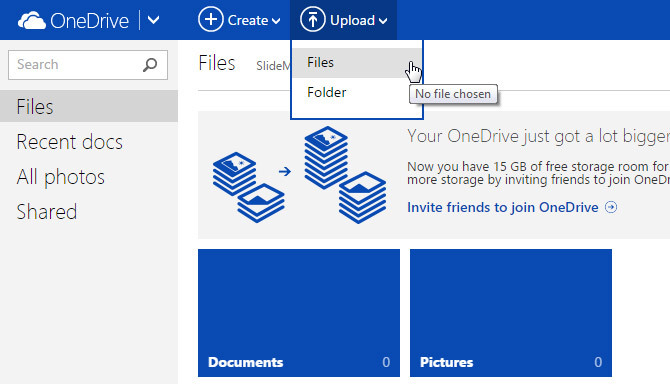 An easy way to view presentation online is uploading the file to OneDrive. OneDrive let you easily store and share photos, videos as well as Microsoft Office documents, then you can share the files anywhere and on any device for free. Open your web browser and go to OneDrive’s website (https://onedrive.live.com) and sign in using your Microsoft credentials. 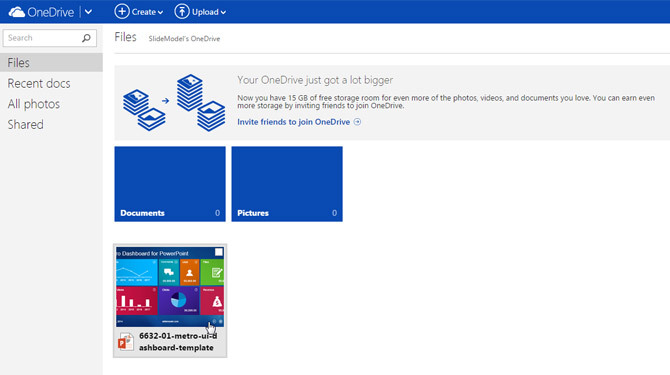 You can create a free OneDrive account with 15 GB when you sign up. Once you are logged in, look for the Upload menu in the top navigation bar and then click Files. Now you should be able to select a file in your computer and confirm to begin the file upload process. As soon as the upload process is completed, the new presentation file will appear in the browser. When you upload presentations or any other document to OneDrive, automatically it becomes available to be used in the online versions of Microsoft Office programs. 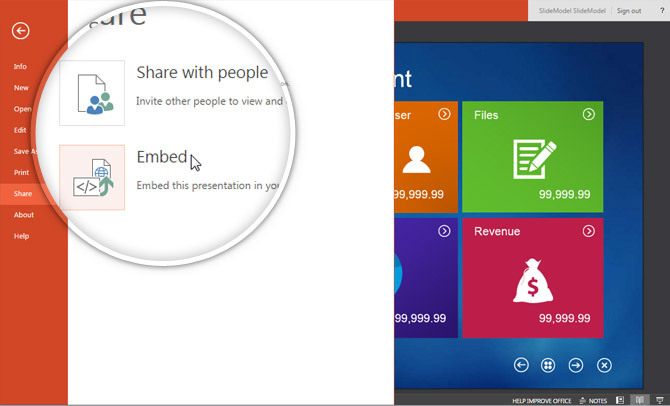 So, if you click the presentation that was previously uploaded to OneDrive, it will be opened in PowerPoint Online. 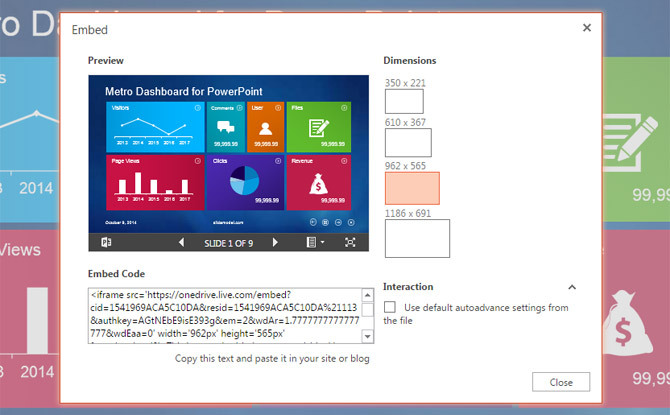 The screenshot below shows an example how the Metro Dashboard Template for PowerPoint looks once it is opened in PowerPoint Online. It is great to see that all animated graphics (PowerPoint animations & transitions) are preserved as well as other PowerPoint capabilities. Having the PowerPoint presentation opened online, you can control the presentation slides by using the PowerPoint Online Viewer’s control bar at the bottom of the screen. Alternatively you can start the Slide Show by clicking Start Slide Show option in the top menu. If you want to embed this presentation in your blog or websites then you can generate an embed code directly form this same PowerPoint Online Viewer. Go to File -> Share -> Embed to open a new dialog box with embed options. You can choose the dimensions. This will depend on the width you are using in your blog or webpage. You can pick any of the existing presets or manually edit the width & height in the code that is generated. Then copy the Embed Code text and paste it in your site or blog web page. WordPress is one of the most popular blogging platforms. If you need to publish a PowerPoint presentation in a blog then you can easily use the Embed code provided by PowerPoint Online to embed the presentation online. 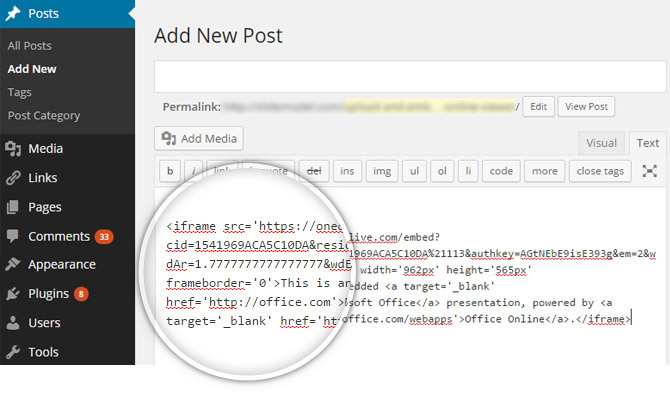 Copy the embed code from PowerPoint Online and then go to WordPress Administration page in your blog (you’d need to sign in to your blog first). Then create a new post or open an existing post where you want to embed the presentation. Make sure to open the Text editor (instead of Visual editor) so you can paste the HTML code. Once you finish, save the changes and then click Preview or View Post in order to see how the blog post looks once published. Even if there are plenty of other 3rd. party solutions to publish PowerPoint presentations online like SlideOnline, using built-in Microsoft Office features ensures your presentation published online will retain most of the visual elements, animations, transitions and presentation file properties as the conversion process is provided by Microsoft. 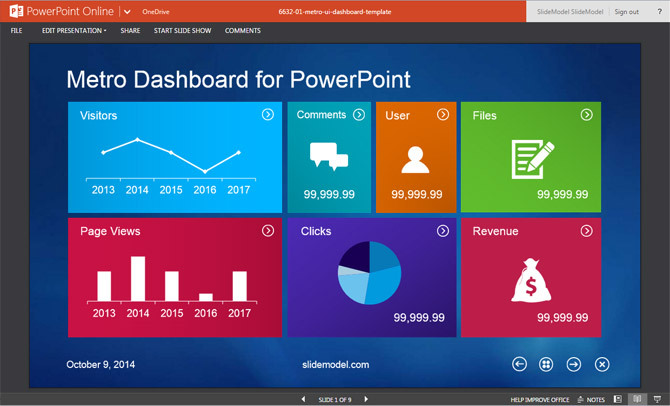 One of the benefits of PowerPoint Online Viewer is that you don’t even need to have PowerPoint on your computer or laptop in order to watch the presentation remotely. 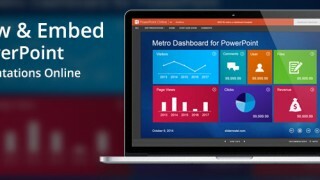 This is a preview – You can download the full version of Metro PowerPoint Template.